This knife was initially called the Pro-Hunter/Venator when introduced in 1991. It is based on the C03 Hunter model and was altered to have Kraton rubber inserts for extra grip. 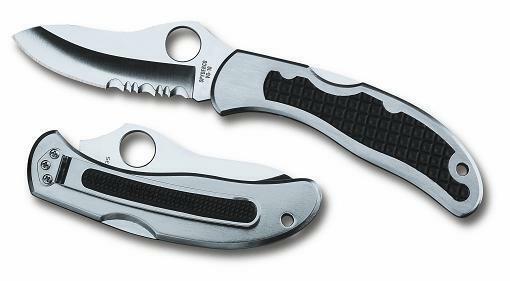 The C33 Pro-Grip which was based on this knife was eventually renamed to the C13BK Pro-Grip. This knife was discontinued in 2005, but as with many Spydercos, may make a re-appearance in the form of a Sprint Run. This entry was posted on Monday, March 23rd, 2009 at 9:18 pm	and is filed under 2" to 3" Knives, Designer - Sal Glesser, Handles - FRN, Handles - Rubber Inserts, Manufactured - Japan, Steel - ATS-55, Steel - VG-10, Type - Folding Knife, Type - Hunting Knife. You can follow any responses to this entry through the RSS 2.0 feed. You can leave a response, or trackback from your own site.